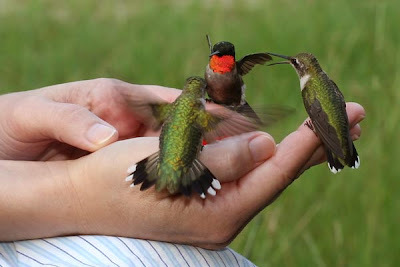 It is time to think about getting those hummingbird feeders up and start enjoying these scrappy little guys. 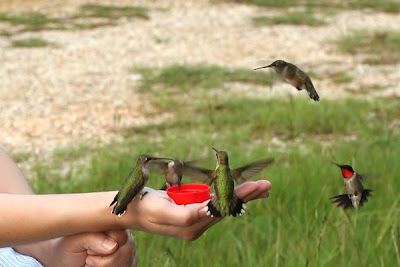 We prepare the hummingbird solution by using 1 part sugar to four parts water. I do not use red dye to attract these birds. It seems they can find the food without introducing the red color into their diet. 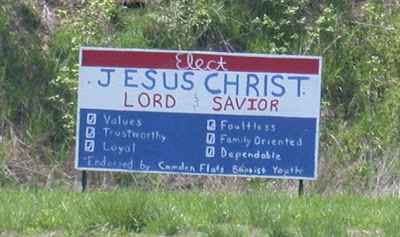 Elect The Man From Nazareth! Well, tis election time and as you can see the population of county election signs at the Junction of Rt. 5 and 119/33 in Glenville is well on its way to becoming an eyesore. It will be super when the election is over and we can return the area back to Mother Nature. 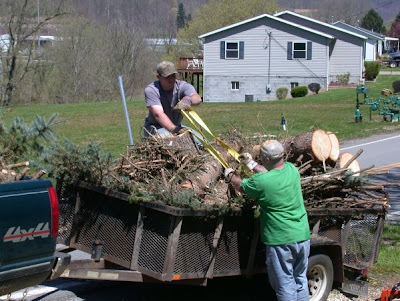 I know the expenses that are incurred in signs and other advertising in the county could better be used for such things as new playground equipment for kids of Gilmer County. Oh well, I do not even want to know the millions that are spent on state and national elections! As I was pondering the beauty of the election chaos at the intersection, I noticed the sign at the end of the line. Congratulations to the Camden Flats Baptist Youth for having imagination and innovation. The debate continues to decide whether or not cougars exist in West Virginia. We do know that a few have been kept as pets and then released when the pet becomes what it should be - a wild beast. We do have a little known Mountain Lion facility in the state. 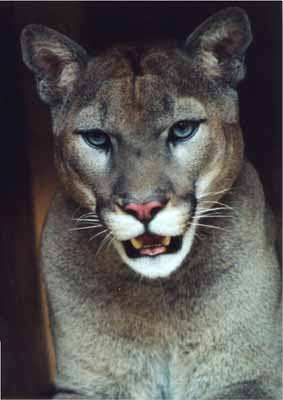 Below are excerpts from their website at http://www.cougarsanctuary.org/index.html. 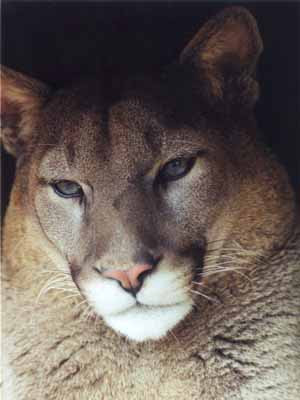 The Coppers Rock Mountain Lion Sanctuary is dedicated to Rescuing Abused and Neglected Cougars and is a 501(c)(3) non-profit corporation located on 170 acres just outside of Morgantown, W.Va.
We are an all-volunteer sanctuary in the mountains of West Virginia. We provide a permanent home to neglected cougars that need a safe haven. We are situated in their natural environment and we make them as comfortable as possible for the rest of their lives. We pay for their care through donations and grants. We strive to reach to the community, to support education about cougars. We encourage volunteer work to help with the maintenance and expansion of the sanctuary, and we provide opportunities for groups to visit the cats. We are also a great way for local corporate donors to give back to the community. 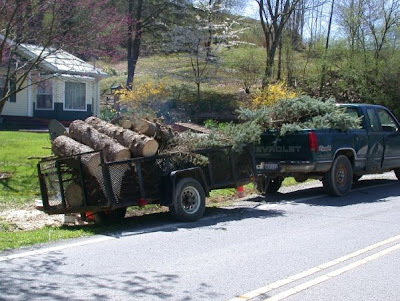 We are fully licensed by the West Virginia Department of Natural Resources and the U.S. Department of Agriculture. We are recognized by the IRS as a 501(c)(3) nonprofit corporation. I would suggest this is a great cause and need your donations. 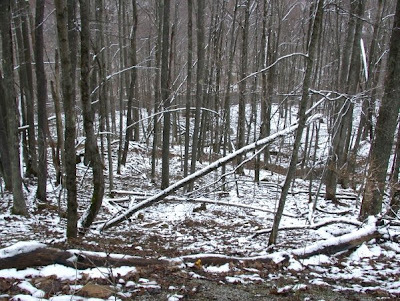 Following is specific information from The Cooper's Rock Mounatin Lion Sanctuary. We are an all-volunteer organization. There is no paid staff at the sanctuary. All donated funds go directly to the support of the mountain lions and the infrastructure of the sanctuary. We are a non-profit organization. Donations are tax deductible in accordance with federal tax codes and where applicable to individuals. 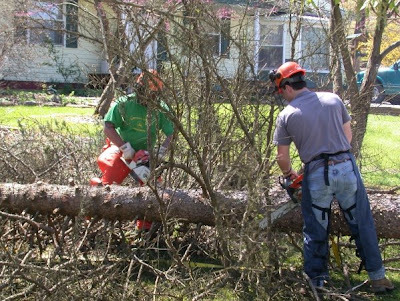 If you have a special skill, such as operating heavy equipment or installing electrical systems, feel free to donate services or labor. 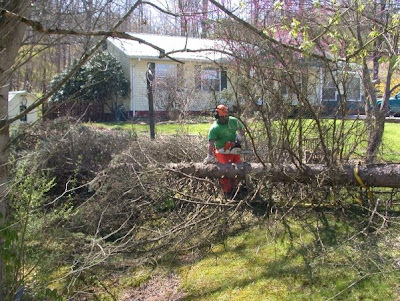 If you're in the area and can be on call to help with projects on a day or two notice, leave your phone number and help with short tasks periodically. Goods that we need include office supplies, paper suitable for printers, printer cartridges (for the HP Inkjet 5550), chain link fencing, tools, and stamps. At the moment we also could really use a laser printer and a four-wheel-drive vehicle of some sort. We publish the quarterly newsletter from our homes. It costs approximately $100 to print and publish, plus the cost of stamps every quarter. We currently mail the newsletter out to approximately 125 people on our mailing list, plus extra copies on hand for visitors and to distribute locally, bringing the total printing to nearly 200 copies per quarter. If you'd like to sponsor a newsletter, please contact Mark at mark@cougarsanctuary.org. If you'd like to donate meat, please call in advance to determine the need. There are conditions on meat donations. The meat must be raw; preferably has bones (occasionally we accept meat without bones but this is not usual); no spices, no pre-treatments, and no built-in pop-up thermometers; and the meat must not be from medicated animals. We prefer to know the source and how old the meat is. A perpetual need is to expand our capabilities of holding frozen meat. We currently have floor model freezers but would prefer to upgrade to commercial freezers. If anyone can help with obtaining this sort of equipment or building a walk-in freezer with a staging area, we'd really appreciate that. We would like to be able to stockpile frozen meat during hunting season when people are especially generous, but are currently unable to do it. When our eldest daughter was 17 months old, this photo and an accompanying article was published in The Ravenswood News on Thursday, October 28, 1971. 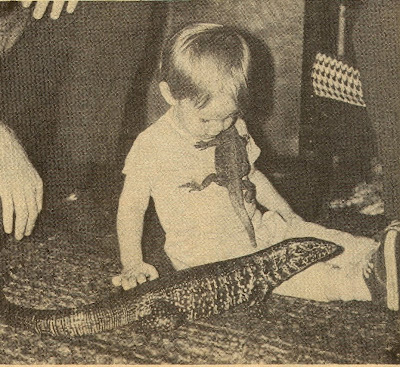 The caption read "Seventeen Month Old Rachael Meads is as much at home with a Tegu lizard and Chuckwalla as most children are with conventional pets." Yes, when our daughters were growing up we had a wide variety of critters including possums, skunks, lambs, goats, chickens, pythons, ground hogs, hedgehogs, cats, dogs, - the list goes on! I remember the Tegu and Chuckwalla. Both did well and lived long lives. The only altercation was when Judy placed a laundry hamper on the Chuckwalla's tail. Never fear - like most lizards, the tail regenerated. 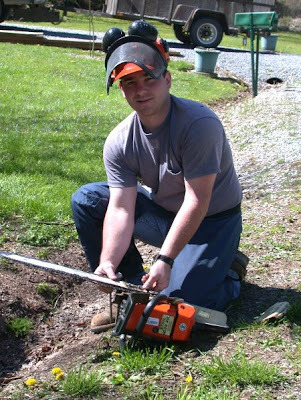 Yesterday I worked in the yard. 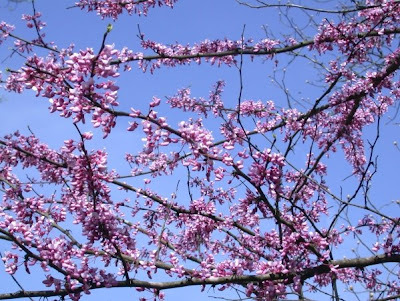 I am always amazed at the way the redbuds produce their flowers. These critters do not produce flowers at their tips or at the usual locations of most plants. 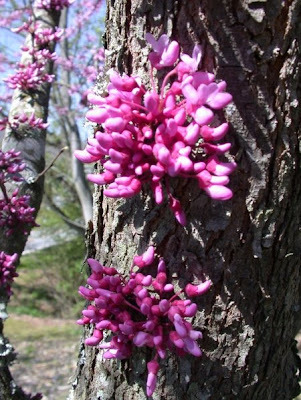 The flowers bloom from locations all along the stem even the thick trunk areas. As I was mowing the yard, I saw my old friends emerging from the leaf litter. 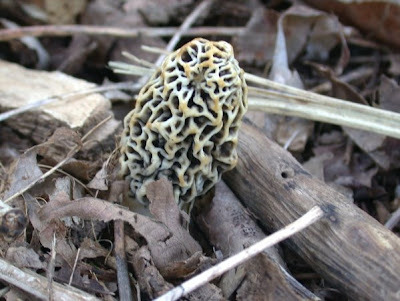 Yes, the morels are growing. This weekend it is supposed to rain and stay warm. 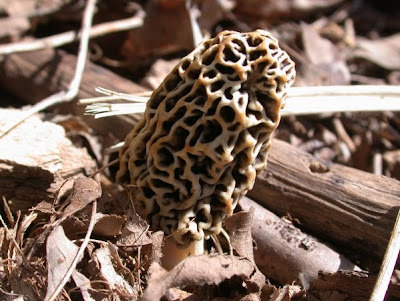 This will be a good time to go morel hunting. The spruce above, located on the corner of our lot, is 46 feet in height and was planted in the early 1970's. We received the tree from Washington State when my Mom brought it back with her in a suitcase. She flew to the Pacific Northwest to visit my grandparents, Ben and Olive Davis. Grandpa Ben was a retired Methodist minister and both of my grandparents loved to garden. My memories as a kid include picking their wonderful crop of raspberries and seeing Grandma's wonder flower garden. She loved calla lilies. 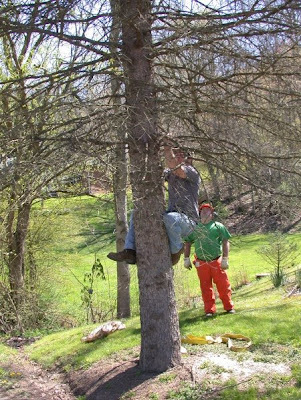 Well, the ole spruce has been dying in the past few years and we decided it was time for it to go to tree heaven. We contacted the GSC Forestry Department and two wonderful fellows from the Forestry Club arrived to take this part of our history away. Michael Goff from Ritchie County and Thomas Wilsoncroft from Harrison County arrived. I was gone to meet my Mom and Sister for lunch. When I returned, the project was completed. 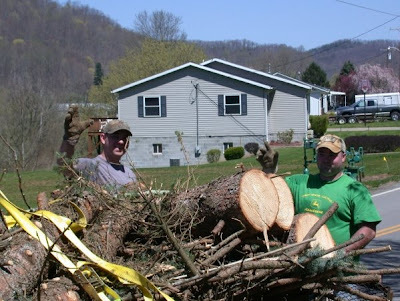 Judy said that she was amazed at the skill and care that these two foresters took in extracting the tree from our premises. 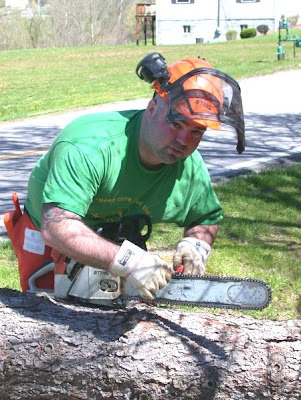 The two fellows are Seniors in the GSC Forestry program. They certainly know their business. I can not image me scaling a tree these days. 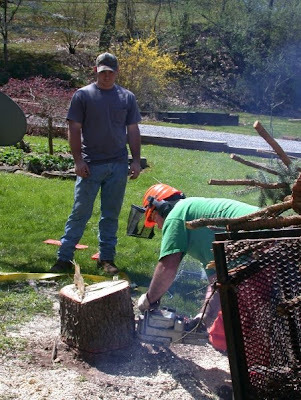 When the tree came down, the work of cutting and loading the wood began. 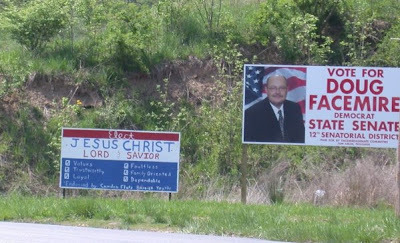 We certainly appreciate the work of these two gentlemen. What a cleanup job! You can not even tell that a tree has been removed except for the stump remanents at ground level. It took less than an hour for the total project to be completed. Thanks, guys, for a job well done! This morning our pal, Sharon Phares, picked us up and we traveled to Flatwoods to have breakfast at Shoney's. This was the day Sharon had planned for us to venture into the wilds of Webster County. The day was cloudy and a little rain appeared, but that did not stop these able explorers. After a fine breakfast buffet, we drove along the mountain ridges from Flatwoods, and in a little over an hour descended the mountains into the town of Addison or Webster Springs. Webster Springs, WV is the county seat of Webster County. Interesting is that the name of the town, is Addison and the name of the post office is Webster Springs. The town was incorporated in 1892 as Addison and named for Addison McLaughlin, upon whose land the town was originally laid out. The post office name, Webster Springs, is a combination of the name of the county with the various sulphur springs found here. 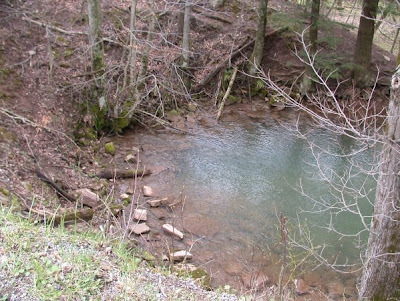 We had to show Judy the famous salt sulphur spring located on the site of the Webster County courthouse. We also pointed out to the good wife where the famous Webster Springs Hotel was located. In 1897, Sen. Johnson N. Camden built a 300-room resort hotel, the Webster Springs Hotel, complete with Russian and Turkish baths, where visitors could enjoy the "medicinal" qualities of its salt sulphur waters. The first elevator in West Virginia was installed in this hotel. In 1926, the hotel was destroyed by fire, and never rebuilt. Leaving Addison (Webster Springs) we turned onto the Bergoo road. The road is certainly not a four lane (or two lane), since it is located directly beside the Elk River. After we left the hamlet of Bergoo, Sharon took us to Whitaker Falls. Whitaker Falls are really lovely! 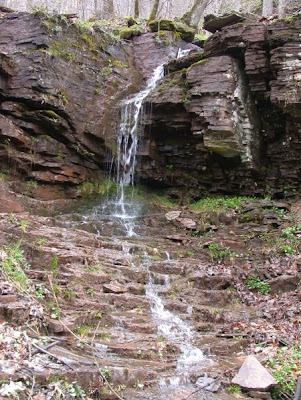 The 16-foot high horseshoe-shaped waterfall is a special sight. The girls opened the car's hatch and appeared to be preparing for a quest. Look at that expression on Sharon's face as she grasps her special hoe. It could only mean one thing! We were off to dig ramps for supper. 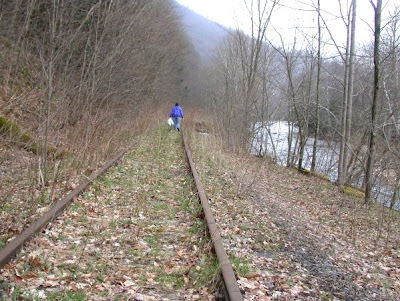 The abandoned railroad track going up the Elk River was our path. This is a great walk. 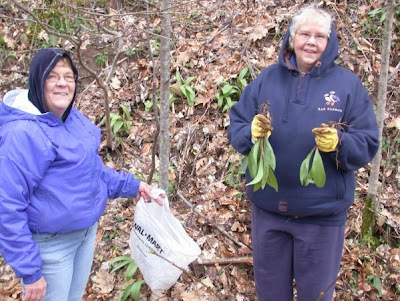 As you see the ladies were successful in their ramp digging adventure. 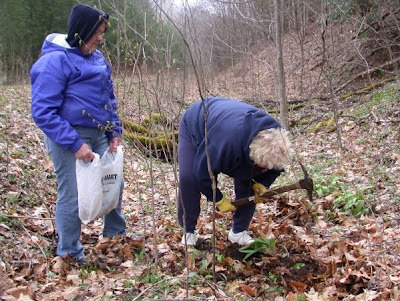 I, on the other hand, could not help in the actual digging as I was documenting the collecting team's efforts and photographing the plants that were emerging from their winter sleep - plants such as the hobblebush below. The hobblebush is an unusual flowering shrub with two kinds of flowers: an inner circle of small flowers surrounded by larger flowers. 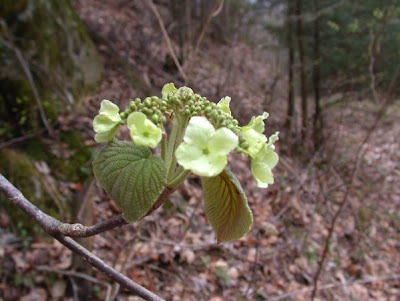 The hobblebush is a member of the Honeysuckle family, Caprifoliaceae. 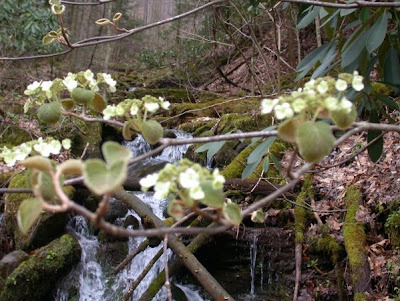 It is always great to see Dutchman's Breeches and trilliums in the woods. 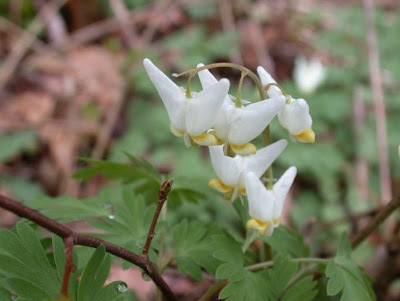 Dutchman's Breeches is one of many plants whose seeds are spread by ants, a process called myrmecochory. The seeds have a fleshy organ called an elaiosome that attracts ants. The ants take the seeds to their nest, where they eat the elaiosomes, and put the seeds in their nest debris, where they are protected until they germinate. They also get the added bonus of growing in a medium made richer by the ant nest debris. Most folks see the white trillums along the roads in the spring. The red trillum below is not so easily seen. The root was traditionally used as an aid in childbirth, hence the name “Bethroot” (a corruption of “birth root”). Native Americans used root tea for menstrual disorders, to induce childbirth, and to aid in labor. The whole plant was made into a poultice used to treat tumors, inflammation, and ulcers. 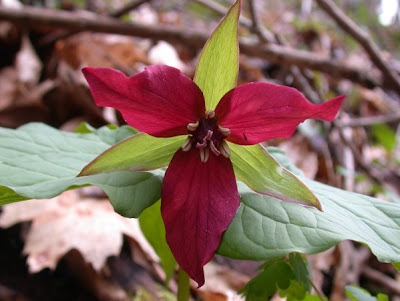 The red trillum is really a beautiful plant. Many scenic waterfalls flow into the Elk River. It seems that these waterfalls are perfect spots for cuddling. 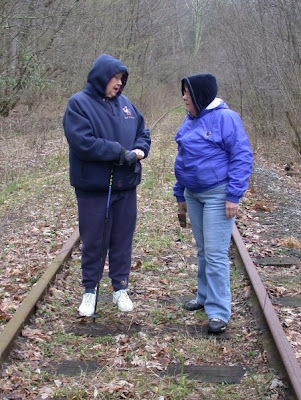 Sharon is seen below walking down the railroad with her prize of ramps. She is one expert ramper! 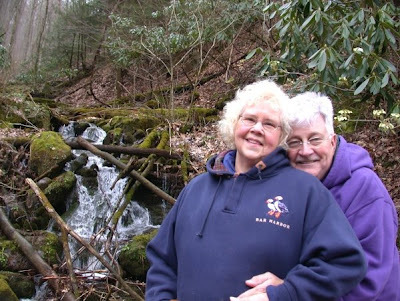 As we were leaving the Elk River area, Sharon said, "I have to show you guys the headwaters of the Elk." We traveled several miles from Whitaker Falls and, there beneath a hill, emerged the waters of what would quickly become the majestic Elk River. 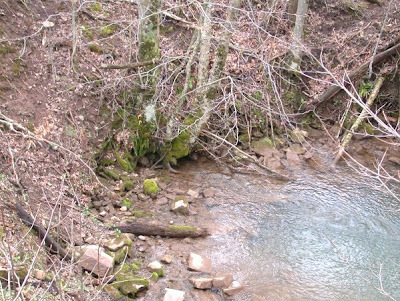 Waters flow from the rocks around the base of the hill to create the first deep pool of water which will become the Elk River. Another showy plant was blooming in this area. It was tucked in between populations of skunk cabbage. The Marsh Marigolds were in full bloom. 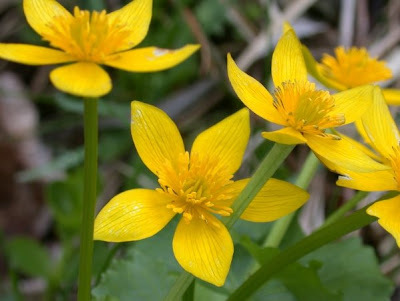 The marsh marigold has been used for medicinal purposes throughout history and has appeared in literature as far back as the time of Shakespeare. 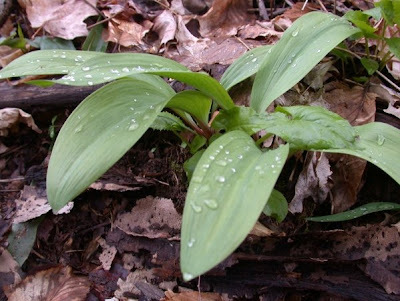 The complete plant is edible but bitter in taste if eaten raw. Most often, the leaves are cooked and eaten like spinach. We returned to Webster Springs driving over Point Mountain. 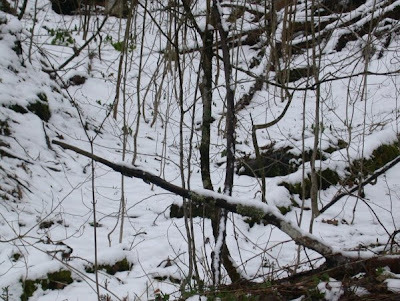 Yes, the conditions in the woods changed. We went from a spring-like day in the valley to winter conditions on the mountain. What a great time! As we traveled back into Webster Springs (I mean Addison! 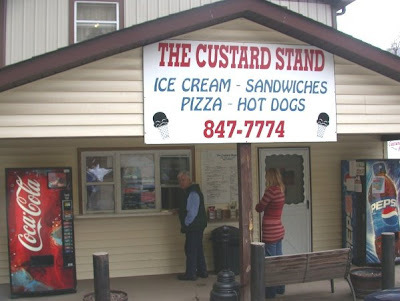 ), we had supper at the legendary gourmet establishment known as "The Custard Stand". One has two choices when eating at this stand – either enjoying the food on an outside picnic table or in your car. We opted for the car since it was cold. 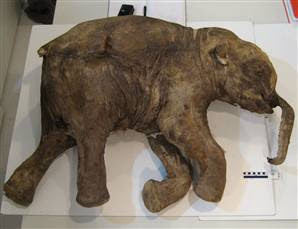 I thought I would share this remarkable photo and information of a baby mammoth supplied by Reuters. The albino alligator is always an attraction at zoological parks and exhibits. When teaching genetics, we would discuss at length the effects of being homozygous recessive for albinism in the human population. Albino folks have been persecuted throughout the ages. Now in animals it is a little different story, but there are still problems, especially dealing with the UV rays of the sun. Here is some additional information on last year's new exhibit at the Knoxville Zoo by AP writer Elizabeth Davis. KNOXVILLE, Tenn. - This white alligator has it made in the shade. Without an alligator's normal dark camouflaging color, the new inhabitant at the Knoxville Zoo would not live long while exposed to predators or the sun. In an exhibit made to look like the Louisiana bayou with tree stumps and hanging moss, the 12-year-old American alligator spent one recent afternoon basking under a heat lamp beside a warm pool with one claw lazily dipped in the water. If outside, her skin would burn in the sun. An albino gene makes the alligator's skin white and her eyes pinkish, and the rare find creates a popular exhibit at zoos around the country. The exhibit at the Knoxville Zoo — marketed with the slogan "Look in Dem Eyes" in reference to a legend that good luck will follow those who see the animal — will last through Labor Day. Zoo visitors paused in a dark lobby and peered through the glass window at her. Occasionally, one eyelid would open and reveal an inner membrane that makes the eye look milky, but otherwise the alabaster-tinted body was still. "Is she real?" is the most common question from visitors, says Phil Colclough, assistant curator of herpetology at the zoo. "Nobody believes she's real. They stare until she takes a breath or moves her eyes or jumps in the pool." Other zoos and tourist attractions have white alligators in the United States, totaling around 50. A whiter shade of paleSome white alligators are albino, meaning they lack a dark pigment called melanin, and their eyes appear reddish because of the blood vessels underneath. 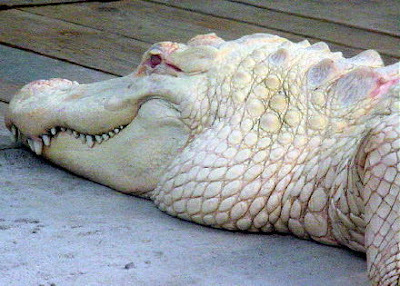 Another kind of white alligators are leucistic, meaning they have white pigment and blue eyes. 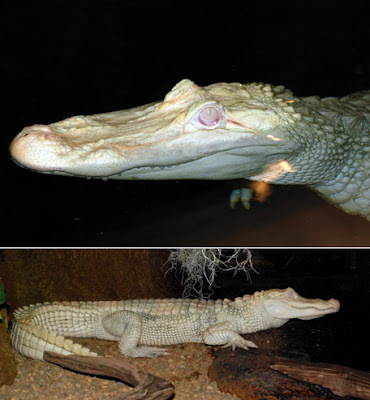 The Aquarium of the Americas in New Orleans has leucistic alligators found in a Louisiana swamp in 1987. Three leucistic gators were found in 2003 on Hilton Head Island, S.C., and later seized by state officials, who also arrested the men who discovered them. Knoxville's alligator is on loan from the Alligator Farm Zoological Park in St. Augustine, Fla., which has about 30 animals that have been acquired over the last 15 years from a commercial farmer in Cut Off, La. The albinos are found in the same nest every year and are believed to be produced from the same male and female who both carry the recessive gene for albinism, said David Kledzik, curator of reptiles in St. Augustine. ‘Come get your albinos’The Florida park made a deal with the farmer to get the albinos. 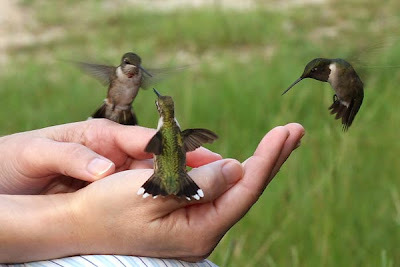 He hatches and raises them until he is ready to give them up, he said. "Every few years we get a call, 'Come get your albinos.' We go out there and get the albinos. We may get six or eight a trip," Kledzik said. 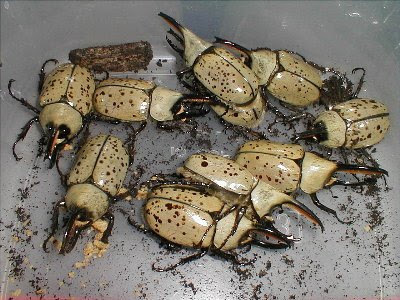 The order Coleoptera is the largest insect order with its many varieties of amazing beetles. When teaching entomology, our students would collect many varieties of beetles including the Rhinoceros Beetle, one of our largest beetles. They were always amazed with its size. Rhinoceros beetles are also the strongest animals on the planet, proportionally. They can lift up to 850 times their own weight. To put this into perspective, if a human of average height and weight had the strength of the rhinoceros beetle, it would be able to lift a 65 ton object, for example, an Abrams Tank. Females resemble monstrous spotted June beetles while the males look much more exotic and possess a horn on both the pronotum and head. The horns of the male are used in fighting over females and food. Note the collection of males below. I remember one day we were collecting on the banks of Cedar Creek when one of the class yelled something about puffs of smoke. Yes, she had discovered the wonders of another beetle, the bombardier beetle. The beetle's abdomen essentially harbors a small chemical lab and combustion chamber. The gases react inside the confined chamber, eventually cranking up the heat and pressure to a point at which a valve is forced upon, and the toxic jet spurts out. From twin ‘exhaust tubes’ at his tail, this beetle fires into the face of his enemies boiling-hot noxious gases with a loud pop. 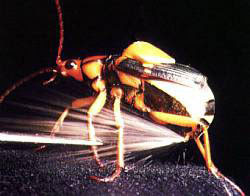 The defensive spray of the bombardier beetle Stenaptinus insignis is ejected in quick pulses (at about 500 pulses per second) rather than as a continuous stream. The pulsation may be a consequence of intermittency in the explosive chemical process that generates the spray. The ejection system of the beetle shows basic similarity to the pulse jet propulsion mechanism of the German V-1 "buzz" bomb of World War II. Researchers from Leeds University have replicated the process in the lab, and a company called Biomimetics 3000 plans to explore the possibility of applying the findings to medical technology, plus inhalers, fire extinguishers and even car fuel-injection systems. Oh, the wonders of entomology! 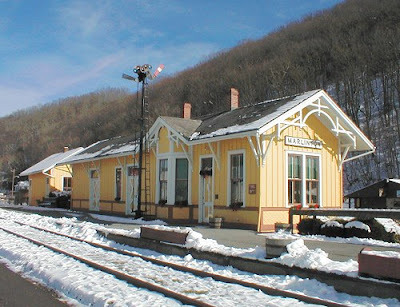 The Marlinton Depot was always a welcome sight when we would visit in this Pocahontas County town. We would go to French's for breakfast and the depot was there greeting us with its bright yellow paint and classy architecture. The depot sadly burned on Friday, March 28th. The 107-year-old Marlinton train depot that burned Friday morning was on the National Register of Historic Places, as one of the last remaining examples of the trademark bright-yellow stations of the Chesapeake & Ohio Railway's heyday. "It's a total loss," said Shirley Adams of the Pocahontas County Convention and Visitors Bureau, which was housed in the restored depot. "We were the only existing depot that had its original furniture - all destroyed. Totally gutted." The Hillsboro Volunteer Fire Department was called out at 5:20 a.m., Assistant Chief Brad Totten said, to help the Marlinton Volunteer Fire Department fight the fire. Firefighters did not finish at the scene until noon, he said. The C&O Railway train depot in Marlinton, listed on the National Register of Historic Places, burned Friday morning. Cause of the fire is unknown at this time.